Pich Diametral Threads 120-4 D.P. The combination of constant surface and electronically variable spindle drive Heavy Duty Lathe Machine - SC-325-3000 gives the better cutting performance among the best lathes in the market. Combination of precision, power, durability and advance features ensure long - living performance. SC - the state of art technology makes it ideal for tool room and production applications with maximum precision, high productivity, long life to the machines. Speed ranges Range I 50-120 r.p.m. 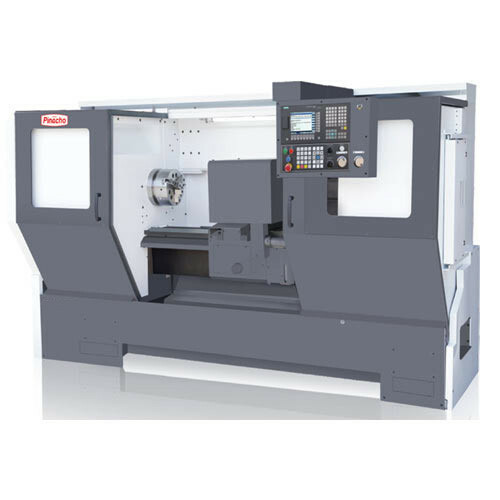 Pinacho came into being in the year 2005 and carved a niche as the known Manufacturer, Importer and Exporter of ST CNC Lathe, SE CNC Lathe and many others. We import these products from our factory in Spain. We provide premium quality products to various industries. The company was established by Antonio Pinacho in the year 1946 and proved itself to be the renowned supplier of Conventional Lathes and CNC Lathe. High quality, high accuracy, and many others are the features that have increased the popularity of our range. Products are manufactured using advanced machines and tested rigorously before being delivered in the market. Our experts conduct regular market research, in order to make our range better. We ensure that the products delivered from our end comply with the specific quality standards and ensure better performance.